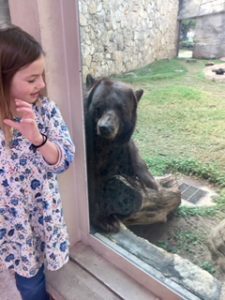 Posted October 25, 2017 by Bailey Heard & filed under Blog, FeaturedOnHomePage. First off, thank you for all of the love and encouragement over this past weekend. 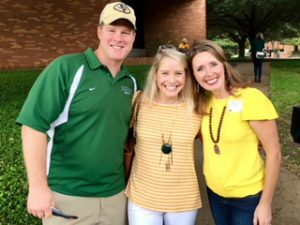 Ellie and I had the most memorable time together at my ten year college reunion and Baylor Homecoming. 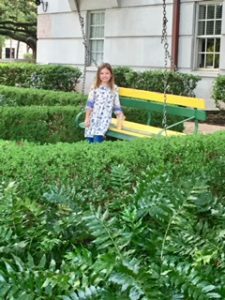 This trip also happened to fall on what would have been my ten year wedding anniversary to my late husband, Andrew, which made the trip all the more meaningful, since Baylor is where I met and fell in love with Ellie’s daddy. Today I want to share some highlights from our weekend adventure! We rolled into Waco, TX, a couple of hours before my class reunion dinner and I knew exactly where I wanted to go. A couple of years after Andrew passed away, his parents and my parents donated money to create a memorial plaque honoring Andrew’s life and legacy in the Truett Seminary prayer garden. We’d only been there one other time, but this was the first time Ellie really understood the impact of her Daddy’s legacy. She beamed with pride as I read her the words on his plaque. Giddy to soak it all up, Ellie asked if we could go see where Daddy took his classes. She asked if we could come back another time to sit in on a class (my little theologian). 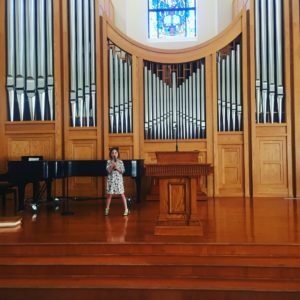 We finished the tour at the Truett chapel where Ellie darted straight to the stage, grabbing the mic, and pretending to be a preacher (apple didn’t fall far). It was such a sweet moment. I wished Andrew could be there to see, and yet I felt like he was with us. A wave of love and pride washed over me at how he might feel about his little girl. It was emotional and wonderful, all at the same time. We packed it in this weekend, from the reunion dinner at the new football stadium to the alumni meet and greet at the brand new business school. 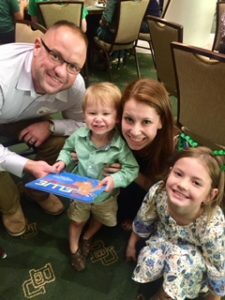 At the event, I ran into a precious sorority sister who, not long after my loss, lost her husband and is now recently remarried to an incredible man, whom I got to meet. Next on the list was the bonfire, where we busted a move to the band’s jams. 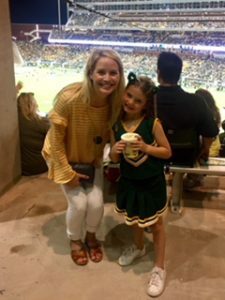 Then I cheered along to the cheerleaders’ chants, which were surprisingly some of the same ones I did back when I cheered for Baylor, while Ellie was mesmerized by the baton twirlers. After waiting in line for an hour for a balloon animal, it was off to bed. The next morning we went to the parade, where I ran into my former cheer coaches (a husband and wife team) and their now three boys! After the parade, we went to a spirit squad reunion, a lacrosse game with some friends, and then let our kids run through the fountains on campus. I promised El I’d take her to some of my favorite places around town, so we went to Bangkok Royal, Spice, and Katie’s Custard. 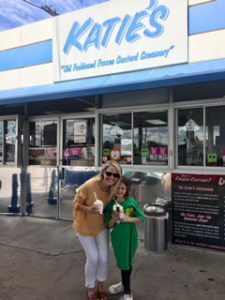 While we were at Katie’s Custard, a sweet girl offered to snap a pic of Ellie and me, and then told me how she’s followed my family’s journey and reads my blog posts, which made my entire day. We then got to spend some quality time with my college mentor, with whom we were staying, before the big homecoming game. After, we headed off to cheer on the Baylor Bears as they took on the West Virginia Mountaineers. After driving around for an hour, I learned we had to park downtown and ride a trolley to the game. Then I learned your purse must be a certain size (small) in order to go into the stadium. I learned this because security informed me, after all the effort to make it to the game, that I must go back to my car (which was downtown) to drop off my purse. On the verge of tears, but holding it together for my little girl, I got resourceful. I called my former cheer stunt partner, who was tailgating, and asked if I could come put my big purse in his truck during the game. He said of course (thank you for saving the day, Robby)! Where there’s a will there’s a way! Ellie made it through half of the game and then we headed back to where we were staying and crashed for the night. Ellie soaked up every second of this trip. The next morning we woke up, drove to my favorite coffee house, Common Grounds, grabbed a hot chocolate and a frozen Milky Way, and then took a stroll on campus to see the bears. 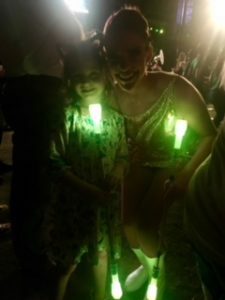 I was honestly a little nervous going on this trip by ourselves and I’m so glad I did it, because it turned out to be a truly magical weekend that brought us closer to each other, and Ellie closer to her Daddy. When we step out of our comfort zones we’re given the opportunity to grow, bond, and create lifelong memories. What’s something you’ve been wanting to do, but still feel a little nervous to try? I’d love to know so I can support you in taking the first step! Special thanks to Matt and Diana for blessing Ellie and me with this trip. You have no idea how much your generosity impacted us. 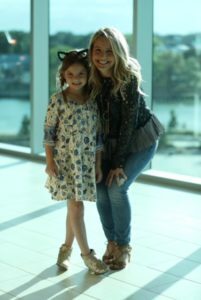 We loved spending time with y’all and your precious little man. Thank you, Kim, for letting us crash at your cabin. Forever grateful for your friendship and mentorship over the years! Last but not least, thank YOU for taking the time to follow our journey. We hope it’s always uplifting and encouraging. Love and Blessings. Beautiful message Bailey. Blessings to you as you continue on your blessed journey. i love you Bay! So beautifully written. I’m so grateful the Lord gave you strength and joy going down memory lane with sweet Ellie. And so grateful El left closer to her amazing daddy!? ?